"21 Jump Street" is rightly remembered as little more than being the springboard for Johnny Depp's fame. And yet, by sheer force of Jonah Hill's will, it's now returned, reframed as a feature-length comedy. And, not to damn the film with faint praise, it is that rare reboot/adaptation that far exceeds the original material. Hill stars as Schmidt, a pudgy high school loser who grows up to attend the police academy, where he is reunited with his former tormentor Jenko (Channing Tatum), a hulking jock, who is again a classmate. When one needs help getting in shape, and the other needs help with academics (see if you can guess who is who), an unlikely partnership is born. When their first bust goes wrong, the duo is reassigned to "21 Jump Street," a new program run by Capt. Dickson (Ice Cube), that sends the youthful looking cops back to high school to infiltrate and take down a drug ring. Schmidt and Jenko are given fake identities as brothers, and they must move into Schmidt's parents' house to keep their cover respectable. It's exactly the kind of hilariously stupid plot device the old show was too cool and self-serious to indulge. Too distracted to have learned which new identity is theirs, they accidentally end up having their transcripts switched, with Schmidt being taken for a track-and-field star, and Jenko landing in AP chem. 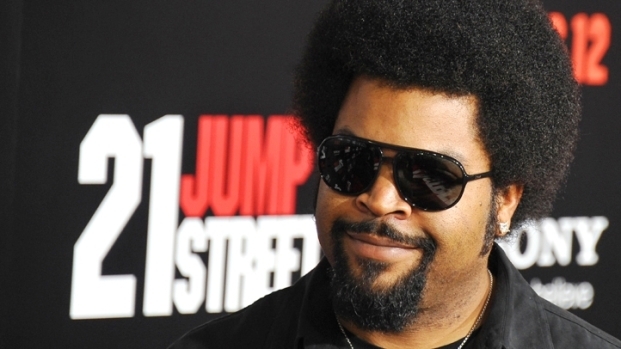 Ice Cube chats at the premiere of "21 Jump Street" about playing Captain Dickson in the movie. Why does he think he was meaner than the original character from the TV show? Plus, did the cast know Johnny Depp was going to film a cameo before it happened? Making things more difficult for them is the culture shock—in the half-decade since they graduated, the cools kids are into environmental causes and tolerance while the jocks and their brethren are now the outcasts. The script, which Hill co-wrote with Michael Bacall, is a just-right mix of clever and stupid, as we experience the glee of watching Schmidt finally get to be cool, the guilty-pleasure schadenfreude in Jenko living life as an outcast, and the inevitable strain this puts on their friendship. 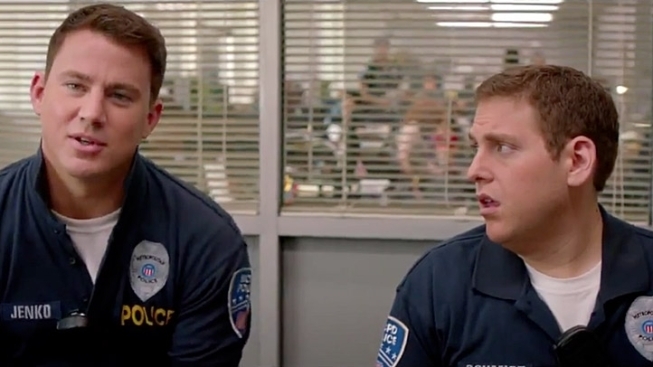 Directed by Phil Lord and Chris Miller (the duo behind "Cloudy with a Chance of Meatballs") "21 Jump Street" is a rapid-fire comedic assault on the senses that's also weirdly sweet and touching. Lord and Miller bring their manic approach to some inspired drug-fueled lunacy, Ice Cube's self-aware "angry black man" act is inspired, and Hill and Tatum both deliver the goods. 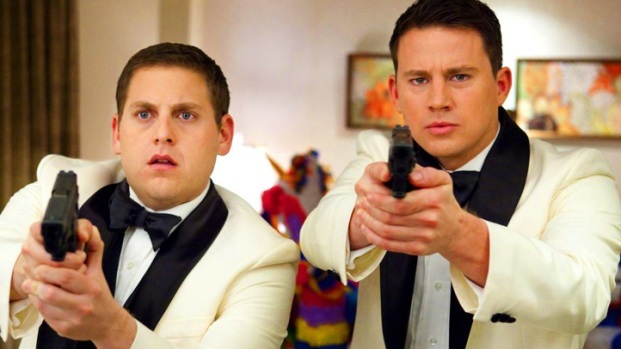 Jonah Hill and Channing Tatum talk about their new reboot action comedy "21 Jump Street." Hill, of course, is a seasoned comedian, while Tatum comes to the proceedings with something to prove. While his timing could be a wee sharper and his energy could use a bump, he deftly plays off his own pretty boy lunkhead reputation. And Brie Larson lives up to her burgeoning It Girl status as Molly, the pretty blonde cool kid who befriends Schmidt, with a disarming smile and bone-dry deadpan. "21 Jump Street" is a sneaky smart comedy that through some alchemical wizardry breathes new life into about a half-dozen dead tired clichés. It's so good you're not even annoyed by the blatant sequel set-up at the end.